Germany, as a nation, is actually very young. Prior to the national unification in 1871, Germany was divided into many kingdoms and principalities, each with distinct customs and even distinct dialects. 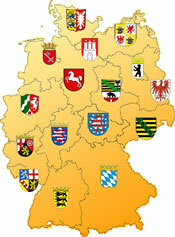 Explore the menus, manners and main travel destinations of the sixteen Bundesländer (states) that today make up the Federal Republic of Germany. Baden-Würtemberg: A Culinary Superlative Baden-Würtemberg, in the southwestern Germany, is home to a quarter of all the Michelin rated restaurants in Germany. Bavaria: Franconia, Munich and Allgäu Bavaria is culturally divided between the North and South, with different language patterns, dialects, attitudes and foods. Berlin: History, lifestyle and home-style cuisine Berlin has become a center for liberal lifestyle and modern zeitgeist and low-cost, high quality living, with a cuisine as colorful as the city itself. Brandenburg: Royal Delicatessen The heart of the former Prussian Empire, is known for numerous significant historical events and for one of Germany’s most delectable specialties. Hesse: Regional Specialties from Frankfurt and Hessen Hesse’s cuisines show the influences of neighbors to the north and south. Lower Saxony: Lore, Legend and Lots of Good Food Germany’s second largest state, stretching from the North Sea to the Harz Mountains, is home to fabulous legends and famed culinary specialties. Mecklenburg-Vorpommern: Among the least densely populated of Germany’s states, this seacoast state boasts recreation areas and a cuisine influenced by the Baltic Sea. A Culinary Tour of The Rhineland… and an agricultural state which is the home to much of Germany’s wine production. Saarland: The French-German Connection Germany’s smallest non-city state, Saarland’s cuisine is influenced by its French neighbors. Saxony: Cradle of Culture, Christmas and Culinary Treasures Germany’s easternmost state has a history more than 1000 years long. Saxony-Anhalt: The Cuisine of Saxony-Anhalt The state of Saxony-Anhalt is an important agricultural producer and home to many of Germany’s food manufacturers. Schleswig-Holstein: Culinary Treasures from Germany’s North The cuisine of this northern-most federal state is dominated by field and sea. Thuringia: The Green Heart of Germany Thuringia’s central location, spectacular landscape and rich agricultural soils make it the vital green heart of Germany.